This recipe was inspired by a recent trip Chef Jesse took to Spain where she sampled lots of delicious tapas and came home wanting to recreate all of them! 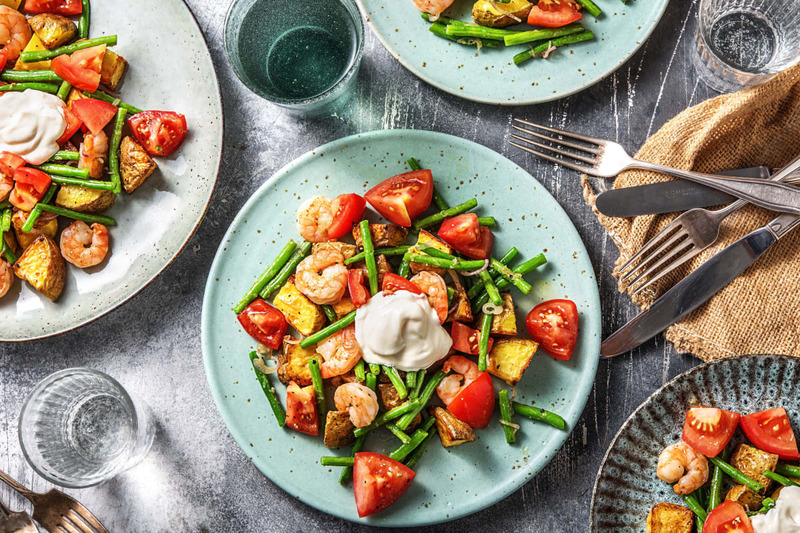 Crunchy green beans, garlicky prawns and gold and crispy roast potatoes are the perfect flavour combination, whilst the tomato salad keeps things really lovely and fresh. Enjoy with a glass of wine and imagine you’re in a Spanish tapas bar...! Preheat your oven to 200°C. 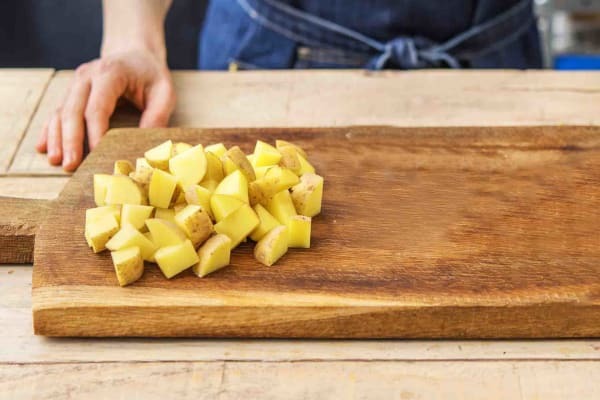 Chop the potato into 2cm chunks (no need to peel). 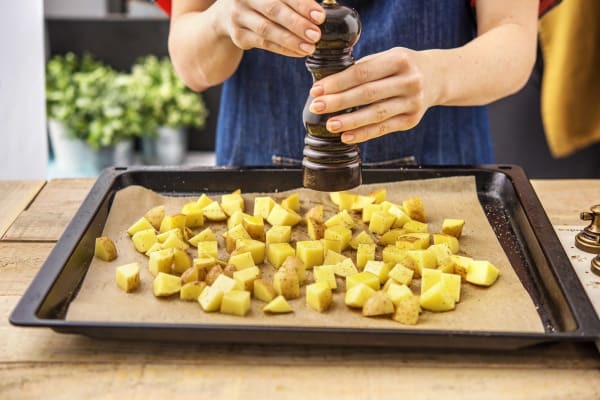 Pop the potatoes onto a large lined baking tray (or two) and drizzle on a splash of oil. Season well with salt and pepper and use your hands to rub the seasoning all over. Arrange in one even layer and roast on the top shelf of your oven until golden and crispy, 25-30 mins. Turn halfway through cooking. 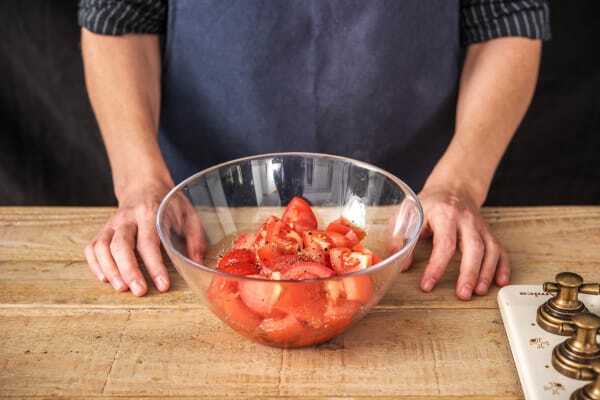 Meanwhile, chop the tomato into 2cm chunks and pop into a medium sized bowl. Season with salt and pepper and drizzle on the red wine vinegar. Stir in the olive oil (see ingredients for amount) and keep to one side. Peel and grate the garlic (or use a garlic press). Trim the green beans then chop in half. Halve, peel and thinly slice the shallot. Heat a splash of oil in a large frying pan over high heat. Add the beans, a splash of water and a pinch of salt and pepper. Fry for 3 mins then stir in the shallot. Fry until the beans are tender, 4 mins. Pop the garlic into the pan. Stir and continue to cook for 1 minute. Transfer the beans to a bowl and set aside. Keep the frying pan! When the potatoes have 2-3 mins left, heat another splash of oil in your now empty frying pan over high heat. Season the prawns with salt and pepper. 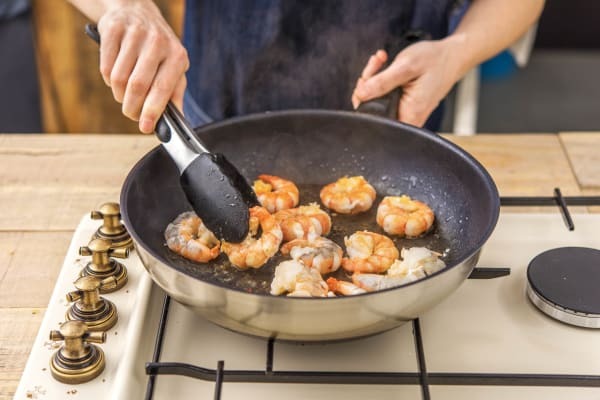 When hot, add the prawns to the pan and stir-fry for 2-3 mins. 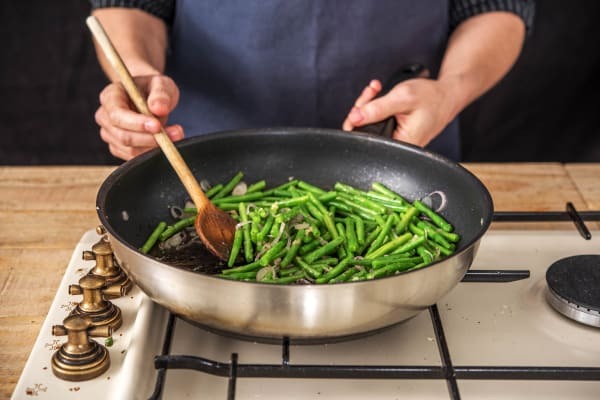 Lower the heat to medium, stir in the green beans and cook for 1 minute more. Remove from the heat. IMPORTANT: The prawns are cooked when pink on the outside and opaque in the middle. Share the potatoes between your plates. 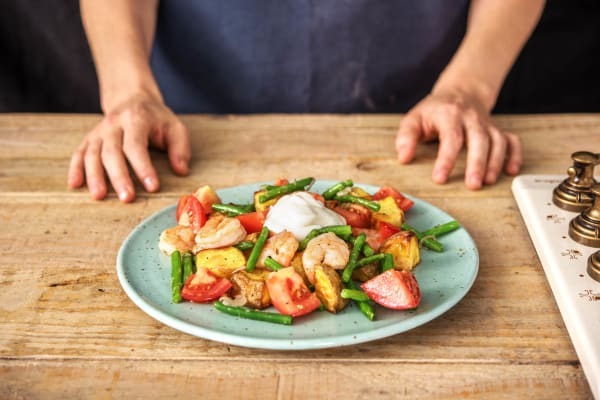 Top with the garlicky beans and prawns and finish with the tomato salad. Drizzle on any juices from the frying pan and salad bowl. Serve the mayo alongside. Enjoy!